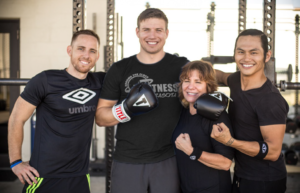 Tribe offers the opportunity to transform fitness into something bigger than yourself—it delivers the promise that ‘together we will achieve more.’ Even as we strive for our own results as individuals, it is the team momentum that creates the dynamic environment for individual success. Starting January 15, 2018, Around the Clock Sarasota is offering three Tribe Team Training programs. There are only 10 spaces on each team so make sure to sign up at reception before Season 1 is full. Each of the three Tribe training programs are refreshed with a new season starting every six weeks, so your training sessions never get old. TribeFIT can be defined as a strength and endurance HIIT conditioning program designed for any committed individual, regardless of fitness or experience, making it the ideal fitness regime. TribeFIT will increase strength and endurance, burn fat and calories and produce functional, full body fitness results leaving you looking and feeling amazing. TribeCORE is a training program intelligently designed to bring toning, strength stability and power to your core. TribeCORE trains the muscles around your pelvis, hips, back, and abdomen, starting from the deep torso muscles to leave you with a slim waistline and firm strong abs. TribePUNCH is specifically designed to give you agility, strength, fitness and fighting skills creating a greater confidence within and a lean toned body. The class guarantees to help you build power, endurance, and mental toughness. For more information on Tribe team training, or Around the Clock Fitness visit, MyAroundtheClockFitness.com, or call, 941-210-3239. Around the Clock Fitness is located at 935 N. Beneva Rd. in Sarasota.